In this era of shrill political sound-bites, there is one clear unequivocal standard that stands out, for those who profess to be faithful members of the Church of Jesus Christ of Latter-day Saints. I cannot in clear conscience support or promote any political candidate, group, party, or individual who embraces anything but a "pro-life" policy. This is one of those issues where the weight of moral considerations far transcend any political policy. Those who choose to tolerate abortion have all kinds of philosophical arguments and rationale that twist this ideal, but can't make this unequivocal statement disappear. They may wish to ignore this in the interest of catering to popular ideas, but ultimately cannot. Those who willfully violate this principle do so at their own peril. 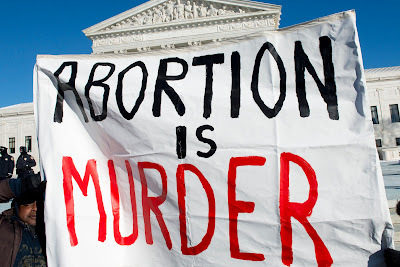 Those who choose to ignore this principle in the current Presidential campaign are consenting to condemn entire generations to a bloody and horrifying death. Abortion is murder. This principle stands.